Autumn is a magical time of year with cooler weather, pumpkin treats, Halloween, and of course, beautiful colored leaves. Desert living doesn’t offer much variety from summer to fall, so when we travel north during this time of year, the amazing leaves are one of our favorite souvenirs. The kids gather leaves at every park and every parking lot. The vibrant variety even enchants me. I find myself finding a few choice leaves for the collection. We typically end up with quite a few leaves and nothing to do with them. Thank goodness for great crafters who have gone before and shared their great ideas! Here are a few of my favorites. 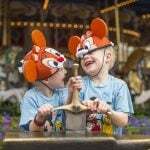 Follow Trekaroo Family Travel’s board Fall Family Fun on Pinterest. There are some great techniques for keeping your leaves looking fresh and most are pretty simple. Soaking in glycerin keeps the leaves soft and gives some flexibility (thanks Buggy and Buddy!). Memories on Clover Lane recommends coating leaves in wax to give them a shiny appearance. You could even do multiple coats of wax to get the shine and thickness you desire. You could go the classic route of pressing the leaves (Yankee foliage offers plenty of tips), but this does leave them quite brittle. 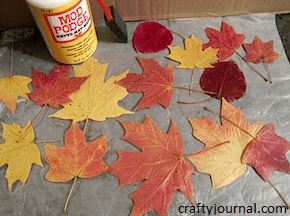 Another method highlighted by Crafty Journal is painting leaves with Mod Podge. This method keeps the colors bright while also providing a little more durability than drying alone. Have you seen these fall leaf bowls by Ashbee Design? They are pretty and would make a great centerpiece, or even a seasonal remote holder! I love the idea of using multiple leaves tocreate a bigger picture. 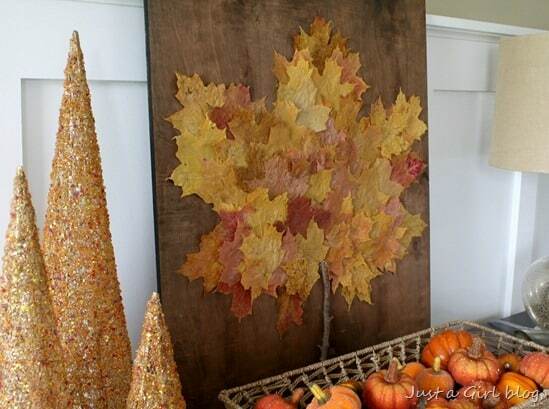 Just a Girl has a fabulous idea that uses 50 maple leaves to create one giant maple leaf, or you can glue them to a wooden initial to create a perfect personalized fall door hanger by the Thrifty Abode. Love your leaves just the way they are? Make a mobile by tying threads on the ends of preserved leaves and attaching them to an embroidery hoop. Create a fall foliage garland (instructions by Garland of Grace) by threading a string through the stems. You can even just put them in a clear vase or scatter them across the table (just make sure to preserve them first). Give the gift of fall to friends who don’t get to enjoy the changing of the leaves with one of these great ideas. 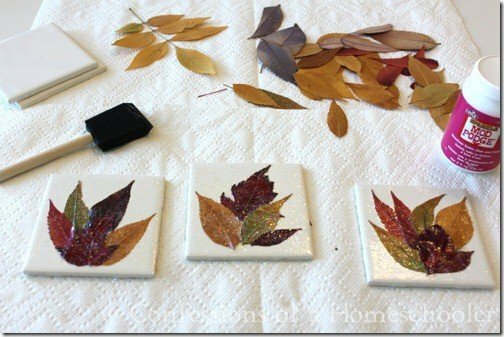 Pick up some bathroom tiles and Mod Podge to create Homemade Leaf Coasters, an adorable idea by Confessions of a Homeschooler. Send a letter made on a Fall Leaf Notecards as instructed by Club Chica Circle , or make a whole set for a friend to use. Laminate a few smaller leaves and use them for fall gift tags (credit-Artful Kids). 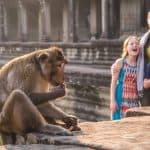 Looking for a holiday idea? Slip a preserved leaf inside of a clear ornament to make the festive nature ornament described in Better Homes and Gardens. Patient children will love the results of these Leaf Candle Holders (Spark and Chemistry). They aren’t too hard to do but you need to let the glue become sticky between applications. 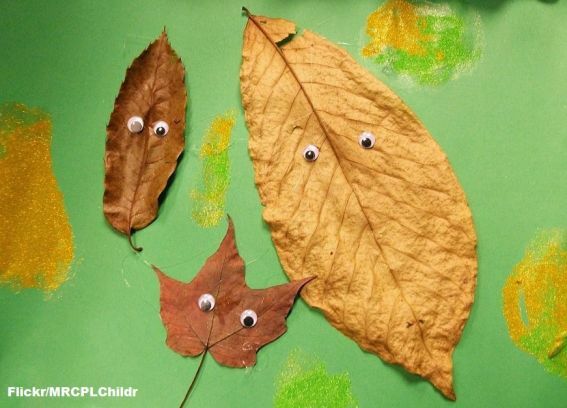 If you have younger kids, try making Red Ted Art’s leaf lantern as a family by gluing leaves between grease-proof papers. Let your little ones use their imagination and design their leaf animals or painted leaf creatures (instructions by Handmade Charlotte). Kids will love displaying one of their own leaf wreaths on their bedroom door; thanks Crafts for All Seasons for the inspiration . If your kids like to dress up, help them create one of these awesome fall leaf masks from Momtastic that encourages imagination and creativity. 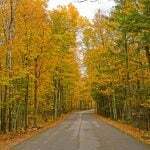 Wondering where to go to experience some vibrant fall foliage? 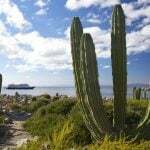 Check out these great recommendations. 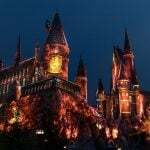 All images used with permission from respective bloggers.